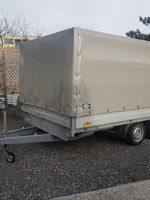 2.5m tandem axle Westfalia trailer, max load 2000 kg, almost new tyres. Gas struts not working (polyester hood doesn't stay open). Ready to use. 2.5m single axle Westfalia, built 2008, no modifications done, in perfect condition. 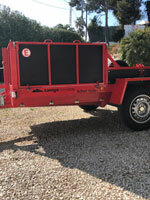 Indespension tandem axle trailer, built 2014, bed dimensions 3.00m x 1.65m. Rear rollers, winch, new battery, new spare wheel. Tyres in very good condition. Serviced annually from new. 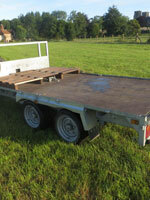 3.0m tandem axle aluminium trailer, purpose built in 12/2006. Internal dimensions 3.04m x 1.34m. Empty weight 938kg. Max total weight 2700 kg. With tilting roof, perfect gas struts. Lots of efficient storage space inside. Guidance rails for the basket. Blocking system for inflation fan. Good tires, spare wheel included. Lock on back doors with key. All documents included. In great condition. Immediately available. 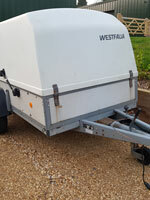 2.5m single axle Westfalia trailer, built 1998, max total mass 1200 kg. 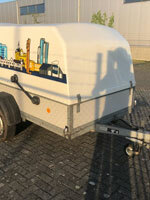 Single axle Suivit trailer, built 2006. Platform dimensions 3m x 1.5m. Max total weight 1250 kg. Emtpy weight 465 kg. Rear roller, open box on front, mounting system for inflation fans, fixing points everywhere around. Tyres in very good condition. 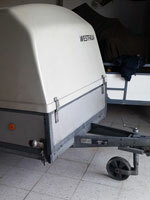 3.0m tandem axle Westfalia trailer, built 1997, inside dimensions 3m x 1.39m. Max load 2000 kg. Complete maintained, brakes are complete revised and new gas struts. No damages in the hood, good tyres. In very nice condition, all documents available. Text can be removed. Immediately available. 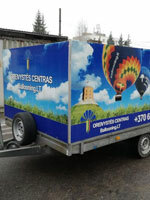 Hapert tandem axle flat bed trailer, built 2010, partly rebuilt in Lithuania in 2018. Platform dimensions 4.25m x 2.00m. Maximum total weight 2000 kg. Technical inspection valid until March 2019. 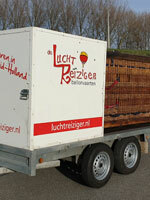 Eduard tandem axle flat bed trailer, built 2002, inside dimensions 5.07m x 2.00m. Max load 2700 kg. 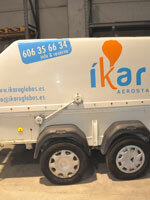 Tyres are very good, fixing points on all sides, wooden floor in perfect shape, sides can be removed if needed. 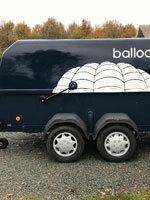 Formerly used with a 250.000 ft3 balloon. 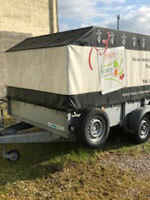 Canigo Remolcs single axle trailer, braked, custom built in 2014, designed for maximum ground clearance. Inside dimensions 2.5m x 1.32m. 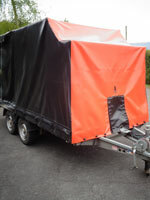 Rear rollers, multiple tie down loops around the trailer, can be either loaded from rear or side. Jockey wheel that folds-up, custom built fan bracket, two spare wheels, 2 set of brackets around for fitting storage boxes. Side panels can be fold down or removed. Located in Spain. Tandem axle flat bed trailer, built 2013, dimensions 3.05m x 1.50m, box on front for envelope and inflation fan, max total weight 750 kg. 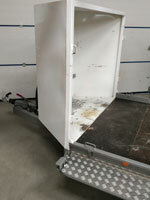 Pongratz tandem axle trailer, built 2017, used for approximately 40 flights, inside dimensions 4m x 2m x 1.6m. Max load 2700 kg, empty weight 576 kg. Cover and metal frame can be removed. 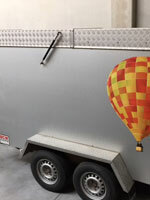 Ifor Williams Tandem axle trailer, built 07/2013, galvanized and welded steel frame, fixed front and side panels made of galvanized steel with enforcement all around. 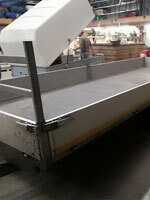 Tandem axle with leaf spring suspension, spring assisted ramp on rear. Plywood floor with resin coating. Inside dimensions 3.73m x 1.77m. Max total weight 2700 kg. Empty weight 625 kg. Reinforced jockey wheel, spare wheel. Built-in winch. Tyres 165R13C. Frame with cover.